AT LAST - the Plain Truth About THE VIETNAM WAR! Well, why do we have such bad news in the world today? Recently, I've been asking in a number of these programs, why does God permit wars? Why does God permit so much suffering in the world today? Because if God is all merciful and all compassionate as people reason, He wouldn't want to see us suffer, would He? And then if He has all power, He could stop it and yet He doesn't. Well, there is certainly a reason, because a purpose is being worked out here below and people don't seem to realize what that purpose is or to know anything about it. And God has mapped out seven thousand years to accomplish that purpose; six thousand years in which God Himself is keeping hands off and allowing the human family to do what it pleases. God has revealed to the human family the way to peace, the way to prosperity and to happiness. And not only world peace but peace within your own self—peace of mind — to rid your mind of fear and of suffering or worries and everything of the sort. You could have your mind ridded of everyone of those things. You could rid yourself of sickness and disease and you could have nothing but good health. You could and the world could rid itself of poverty if we lived according to the laws and the rules of God. God has revealed those but God has not crammed His religion, so to speak, down our throats. God has allowed man to live his own way and so the reason that we have these things is because man has rejected the way of God. Now, it was in such a world that God sent His only Son. And Jesus Christ came with a Message. And His Message was the way out of all this suffering. It was the way to peace but as we read in the prophecies of the Bible, this world knows not the way of peace. That's why we don't have peace. We don't know the way of peace and when God shows it to us, we won't have it. And so what do we have? We have a world in which people have accepted the name of Christ, in which people have accepted certain facts about Creation, the Flood, the Virgin Birth, the Crucifixion of Christ and the real efficacy of the blood of Christ and what it means—it's a fact and also of the Resurrection of Christ and they accept the name of Christ. But the Message of Jesus Christ they have rejected which is a Message of obedience to God because God alone knows the way to peace and to happiness and to prosperity and to a rich, full, interesting, abundant life of happiness and joy. Now, God has made it possible for us to know that way. Why do we turn our backs on it? Why have we not heard it today? Now, to find what that way is and to find why we have not been hearing it proclaimed and why we have not known it or heard it preached, we're going back into the very Gospels that recorded the life of Jesus Christ. Not to just to find out again a message about Christ. We've heard a lot of that and that's good in itself, but we need more. We need to know the Message that He brought. And so, we're going back again through Matthew, Mark, Luke and John to see the Message that Jesus brought because that was the Message of the way to peace. Now, the first six thousand years of this seven thousand years that God has mapped out, my friends, God is allowing man to go his own way. And man has never chosen to go the way of God. Man has never believed that the way of peace was the right way or the way of prosperity. Man has gone the way of inequality—too much for some and too much poverty for too many others. Man has gone the way of sickness and disease. Man has gone the way of war and of strife and of fear and of worry and of empty lives and everything that we have. And so, that's what we have and here we are. Now, Jesus pointed the other way and it's a matter of...it's a voluntary matter. You can have which ever way you want in your own life. Now, the seventh thousand years which is just now almost ready to dawn, God is going to send Jesus Christ again, and when He comes again He's not coming just to point the way and let us do what we please. When He comes again, He's coming to sit on His throne, the throne of His father David and to take over that throne and to reign and to rule the nations with a rod of iron and then so far as Government concerns, an organization over our lives to force on this world the way of God that is the way of peace and the way to happiness and the way to prosperity, good health and everything we want. And you know, mankind is going to fight against it when Jesus comes. They're going to try again to reject that way because the carnal mind is enmity against God. Yes, it is antagonistic to God and some how or other it seems to think God is wrong. And so men will resist and men will again try to fight against the way of God but God will rule through His Kingdom. Jesus Christ is the King of kings and the other kings will be those that have rendered themselves over to God and to God's Law and have yielded themselves to Him and have subjected themselves to the Law of God, have repented of their own selves and their own lives, their own ways and have turned to God in His way and have been begotten by His Spirit, filled with the Spirit of God, have had inputted into them the Nature of God and will then have been changed which means converted. And the word converted means changed from what they are to something else—changed from human to divine, changed from mortal to immortal and from the animal kingdom into the God Kingdom or the Kingdom of God. And the Kingdom of God, the Saints then made immortal, then in the very Family of God with all power, and all the great power of God will do the ruling and they will rule over every town and hamlet, every city, every nation and they will also do all of the preaching and there will be only one Church and one Truth and the earth will be as full of the knowledge of God and of the knowledge of the Truth as the ocean beds are full of water—just exactly as you'll find if you turn back to the eleventh chapter of the prophecy of Isaiah. That's how full of the knowledge of the Truth this world will then be. Alright, now, back into the life of Jesus here and the things that He taught and the customs that He followed, again. And we had just come to this time in, well, in Mark four, verse thirty-five: "When the evening was come, Jesus said let's go over to the other side of the lake." And so they left the multitude. There'd been a multitude there. He'd been speaking to them in parables. We've gone through all of that in the parables of Jesus, how He spoke in parables so they couldn't understand lest they might be converted, yes, and their sins be forgiven them. That's pretty hard to believe, isn't it? Well, I read it to you right out of the Bible and it's in your own Bible if you'll read it. So, when He saw the great multitudes about Him, He gave commandment to depart to the other side and while they were in the boat crossing the lake, to the other side of the lake, there was a great storm that came up and the waves actually beat over into the boat, insomuch that the boat was filling up with water and it was about to sink. Well, the disciples that were with Him became very much alarmed. They were really frightened. They were in plain language—scared. So they awoke Jesus "and they said unto him, Master, carest thou not that we perish? And he awoke, and rebuked the wind, and he said unto the sea, Peace, be still. And the wind ceased, and there was a great calm. And he said unto them, Why are ye fearful? have ye not yet faith?" "Oh, ye of little faith" as one of the other Gospels reported it. Now, here they were all perturbed. They saw something with their eyes and they were so concerned they lacked any power to do anything about it. They lacked faith to trust God to take care of them or do anything. And so, here they were frightened. "And they feared exceedingly," says verse forty-one. That's in Mark four, fourth chapter of Mark, forty-first verse. "they feared exceedingly, and they said one to another, Who then is this, that even the wind and the sea obey him?" They'd been with Him for some time. He had called them. They were His disciples and they still didn't seem to know that He was God manifest in the human flesh. But He was God who became man for the very purpose of first delivering a message for us that the world seems to have rejected and then after that, when He had completed the work that God sent Him to do, to give His life for you and for me. That by His life, that was given when He shed His blood because the blood is the life that when He shed it His life was gone and the penalty of your sins and mine is death and it's death for all eternity. It's the second death from which there will never be a resurrection but Jesus paid it in our stead so we don't need to die that death. Of course it's appointed to men once to die. But from that death there will be a resurrection for everybody who has ever died. And everybody who ever died is going to be made alive and come back to life in a resurrection; but, every man in his own order. Only those that are Christ's that have the Holy Spirit and been begotten of God at Christ's coming and the others not for another thousand years and then there is a resurrection to Judgment. And that Judgment is something you ought to study into and to know because every one of you have relatives and friends who have died and they're coming right back to life in that resurrection. And I tell you, we ought to know something about that Judgment and that resurrection. I want to tell you this much, that in that resurrection, the Books will be opened and the only Book mentioned that will be opened in that resurrection and in that Judgment is the Book of Life which means that a great many that people have thought died lost are going to be resurrected, human, mortal, in that resurrection. And the Book of Life is going to be opened and many of them when they come to a knowledge of the Truth are going to find Eternal Life. I tell you, my friends, and it is good news, many of you have not understood this, but many, and many of your loved ones perhaps have died but you thought were lost and they are not eternally condemned. They are coming up in that resurrection of Judgment. And I don't say that they died saved or that they are saved, either. But you've always heard that there is no middle ground, that everybody is either saved or lost. The Bible does not teach that. You have taken it for granted. You've heard it, you have assumed it, you've swallowed it hook, line and sinker, you have absorbed in your mind, you have believed it. There's a time to be born, a time of youth and with its lessons to be learned and its care-free moments, a time to raise a family to watch your children grow and teach them of life, a time for work, for productivity and doing your part for mankind. There's a time to grow old and enjoy your grandchildren and there's a time for death at the end of a full exciting life. Then what—Heaven, Hell, Reincarnation—what is the answer to this question that has long bothered man? You need to know. Read this free booklet—"What is the Reward of the Saved?" It answers this question in a unique and surprising manner. The Bible nowhere promises what you've always assumed. Be sure to read this informative booklet, "What is the Reward of the Saved?" Why do you believe the fables of men? Why is it we refuse to believe the Word of God and we'd rather believe the things that men are teaching? Let's open our minds to the Word of God and see what it really says and then believe it. It will give us a lot of hope. And I want to tell you it's good news. Well, Jesus said to them, "Why are ye fearful?" Why do you have these fears and worries in your mind? Of course, you don't always find the waves filling a boat out on the ocean or out on the sea someplace, but you find other kinds of "waves" filling the boat that's about to sink that you're in. It might be your business. It might be your home, your family, your farm, whatever it may be. And you think it's going to go on the rocks or it's going to sink or something. And you get to fearing and worrying and you can't make ends meet, you're about to lose your business or this or that or another thing is going to happen or perhaps someone is so very sick and you are frantic, you're at your wits end. Did you ever read way here in one of the Psalms about people...Well, this is out at sea too, but it's only a type, it's a figure, it doesn't have to happen to you at sea. It can happen in other places besides being out at sea and yet here it is in the one-hundred and seventh Psalm and the twenty-third verse: "They that go down to the sea in ships, that do business in great waters..." Now, maybe you're not doing business in that kind of waters but in another and maybe you're not even doing business in that sense—business for yourself. You may be working for someone else, you may have your own farm, your own business, you may be a salaried man, you may be a wage worker, whatever it is, you have your problem and you have your way of earning a living and this economic situation is a great worry to you—it is to nearly everybody. Is there any kind of pain and suffering as bad as that mental pain of fear and of worry which is a fear for the future that the worst is going to happen? "They reel to and fro, they stagger like a drunken man, and are at their wits' end." Have you ever come to that place and whatever is your kind of ship or your business, your home, your farm or whatever it may be? "Then they cry unto the [ETERNAL] in their trouble, and [what?] he bringeth them out of their distresses. He maketh the storm a calm, so that the waves thereof are still." You may have a different kind of storm and a different kind of waves. You all have your troubles and you think nobody else has the same troubles you have. I'm speaking to every one of you. I'm not speaking to your next-door neighbor now. I'm not speaking to that other fellow over somewhere else. I'm speaking right directly to you and you know you're having your troubles too. But if you cry to the ETERNAL in your trouble, he will bring you out of your distresses. He'll make the storm a calm, the waves thereof are still and "they are glad because they be quiet; so he bringeth them unto their desired haven." He'll bring you to yours if you will trust and obey him. Because over in first John you read this, that what thing "whatsoever we ask of him we receive [why?] because we [obey him] and do those things that are pleasing in his sight." And what is pleasing in God's sight? Something that appeases His pride and vanity and makes you unhappy? Oh, my friends, I think if you believe that you don't know God very well. The things that please God, the things that are pleasing in His sight are the things that will make your life full and abundant and rich and happy and will free you from fears and worries and just make life worth living for you—that is what will make God happy. But you know we have to work at it. It doesn't come by laziness, it doesn't come by idleness, it doesn't come by defiance, it doesn't come by resisting God. God set laws in motion that will make us all happy if we would find those laws and follow them. And if you lack the wisdom to know, God says, ask Him and He will give you wisdom and He will open your mind to see if you will throw yourself on His mercy and come to Him and if you will be willing when He opens the Truth to your mind. "Oh that men would praise the [ETERNAL] for his goodness, and for his wonderful works to the children of men!" Does that sound like the so-called God of the Old Testament that's so harsh and so unkind and unjust that wants to make you suffer? I was reading that out of the Old Testament, that is the God of the Old Testament. Yes, oh, that men would praise Him for his goodness, and his mercy to the children of men. Well, why don't you have faith? If you had faith, my friends, you could get rid of these fears and worries; you could find a way to the solution of all your troubles. Listen, if you were a multi-millionaire and you could buy something, someone could come around and sell you something, a policy, or something, perhaps some kind of a service, so that in every problem you come into, no matter what, you could just simply be shown the way out. In whatever trouble you would get into, here would come a force and a power of man that would deliver you and get you out. Here would be a great organization, they would come to your aid, they have billions of dollars and they would have the power, they would bring about whatever is necessary, spend whatever amount of money is necessary to deliver you. If you're sick, well, they have enough money they can have the best specialists and the best treatment and everything and so good and such specialists as you never heard of in just...and just get you out of all your sickness and trouble just almost as quick as you can call on them to do it. How much would you pay if you were a multi-millionaire, if you could get that kind of service so that no matter what you do, you would have the guidance to do the right thing, and whenever any troubles come of any kind or anything out of your control, you would be delivered and you'd have every force and power. You know you can have that? God offers that to everybody that will come to Him and will obey Him and will rely on Him, that will live by every Word of God, that will search Him out in the Bible which is His Word, that will live by every Word of God and that will really obey God and trust Him because when you obey God you're only doing those things that bring about that very condition. That is the thing that will make God happy. God is happy when He sees you and me happy. He loves to make us happy. Listen, a lot of you don't even know what faith is. What is faith anyhow? And why don't you have enough faith, why don't you get answers to your prayers when you pray? Why is it you pray and sometimes pray and pray but it just seems that God didn't answer? Do you know why? Why don't you write in for our booklet on "What Is Faith?" You know millions lack faith to receive answers to their prayers. They lack the faith to free their minds from fears and worries. Now, to a very large extent, my friends, that lack of faith is due to lack of understanding, lack of understanding as to what faith is. Write in for this very attractive booklet. It's not a cheap tract. And I'll send you one copy free if you send me your name and address and ask for the booklet on "What Is Faith?" 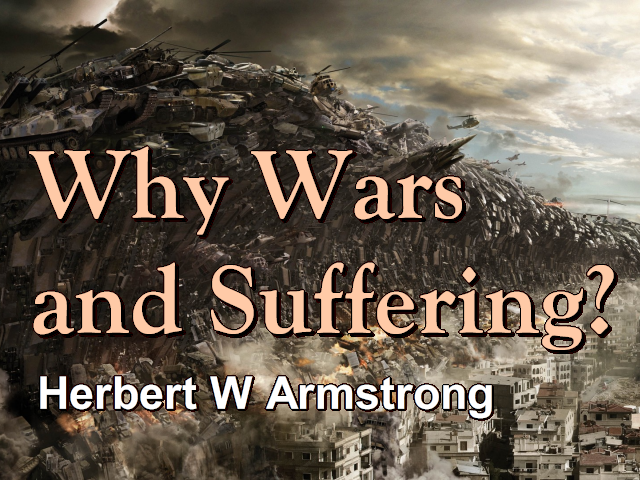 The mailing address is Herbert W. Armstrong, Post Office Box 111 in Pasadena, California. I'll mention that again here in about eight or nine minutes at the close of the program and you get paper and get a pen or a pencil even, right now, while I'm talking. Go get it now, you'll forget it later, you won't have it. Something else will come on your mind and drive it out. Don't let anything else take the place of this. This may mean more to you than anything you've ever done in your life. Learn what faith is and why you don't have it and how you can have it. Well, now let's continue. Continuing Mark the fifth chapter and the first verse now, but I'm going to jump over into the same thing which is in Matthew eight, verse twenty-eight, where Matthew is recording exactly the same thing that continues right on in the story thread here. So, "when..." This is Matthew eight, if you have your Bible, open it up won't you, Matthew eight, verse twenty-eight. Now, "when Jesus was come to the other side [now, they're over on the other side of the lake] into the country of the Gadarenes, there met him two possessed with demons..."
Now, in Mark's account in the fifth chapter of Mark and in Luke's account in the eighth chapter of Luke they only mention one man. Mark mentions only a man coming out of the tombs—"a man with an unclean spirit." And Luke mentions "a certain man out of the city, who had demons" and it was more than one demon. Now, actually there were two men. Mark only mentions one because one of them apparently was the...in the worse condition and had a whole legion of demons in him and certain details are given by Mark that are omitted by Matthew and Luke about this one man. But Matthew mentions two men that were there by the time Jesus met them. And two possessed by demons "coming forth out of the tombs [or as Luke says—"out of the city"] exceeding fierce, so that no man could pass by that way." Now, these men were raving maniacs as we would say today and they were dangerous. They were really dangerous. "And behold [when they saw Jesus now], they cried out, saying, What have we to do with thee, thou Son of God? art thou come hither to torment us before the time?" Now, you read over that...let me just show, you something, friends, you read your Bible and you don't get much out of it. You know a group of people I find are starting to study the Bible all the way through, now, this year. Well, that's a nice thing to do. But I want to tell you that if you want to know how to study the Bible, the way to learn how to study the Bible, is not to start out first by just reading the Bible through because you aren't going to get it, you aren't going to really understand it that way. What you need to do is to learn how to study the Bible and how to study various subjects and find every place a certain subject is mentioned in the Bible. Be sure you read enough all around whatever verse you're reading, to get it in its right setting until you fully understand it and when you get that done, then you begin to read the Bible through and then you'll really understand it. Now, I don't mean to say that you shouldn't read the Bible through, you should, but that's not the place to start, that's the place to come to later, that's what I want to say. Now, you read over that and you don't get any real meaning of it, you just go over it and that's all, you've read it but it didn't mean much. I want to show you how much is in that. Now listen. "And behold, they cried out, saying, What have we to do with thee, thou Son of God?" Of course, we take it for granted. We don't get any special meaning out of it. Now, here it is. My friends, there were the great religious leaders of that time. There were these doctors of the Law. There were these leaders of the Pharisees. There were these rulers of the people in the religion of the time. Did they know that Jesus was the Son of God? No. Here were the greatest people there that didn't know that He was the Son of God. And here comes up a raving maniac, a man out of his right mind. In fact, it wasn't actually the man's mind speaking at all, if you know the truth. But here came these fellows saying, "What have we to do with thee, thou Son of God?" They knew He was the Son of God. Now, listen. Let me just show you need to understand other things in the Bible to understand it. Here is an example of how the Bible interprets the Bible. And it certainly does. When you read that no prophecy of the Scripture is of a private interpretation it isn't talking about one individual understanding it, a private man. It means that that scripture can't be interpreted privately alone by itself but is interpreted in the light of other scriptures found in other places in the Bible. It's about time we learned what the Bible does mean. Now, notice. At another time Jesus was talking with His disciples and He came up to them and He said, "Well, who do men around here say that I am?" They didn't know who He was. And so Peter answered and said, "Well now, some say you're John the Baptist, some say you're Elijah and some say you're a prophet [and some say you're this, some say you're that...]" They didn't know who He was. Not a one of them said He was the Son of God. And then Jesus turned to Peter and He said, "Well, who do you say that I am?" And Peter said, "Thou art the Son of God." How did Peter know? Jesus said, "Flesh and blood hasn't revealed it to you." Flesh and blood does not know. But He said, "My Father in Heaven revealed that to you." In other words, God through His Spirit revealed that to Peter. I want to show you something, my friends. Flesh and blood did not know that He, a human, was also God incarnate in the human flesh. That He had been changed into man, that He was the Messiah. He said, "Flesh and blood has not told you." The only thing that a human man in his right sound mind (I'm talking about of a sound-minded human man can know naturally is that which he sees with his five senses or that which comes to his mind, I mean, with his five senses. He sees through the eye, he hears through the ear, he smells through the nose, he taste by the mouth, he feels mostly with his fingers. And it is only that which you can know by the five senses. Now, the five senses would never have told anyone that Jesus was the Son of God. But these were not human men, these were demons inside of a man and they always know because they're spirit-beings gone wrong. They have knowledge, they can't foretell the future, I can tell you that. But they do have knowledge much greater than men. They are spirit beings and they can have some knowledge of spiritual things and this was a spiritual matter and they knew that He was the Christ. And I want to tell you they recognized that Paul was a servant of God and they recognize today who are the true servants of God. I've met a number of demon-possessed people and they recognize that I am the servant of God. They know but do people know? No, a lot of people think I'm just the opposite. Yes, indeed. But they knew who He was. "...art thou come hither to torment us before the time?" They knew the time hadn't come for their judgment. They are reserved in this so-called hell which is a tartaroo, a different kind of word altogether than a hell of people. It's an unfortunate translation that English word. Well, we'll have to pick it up there and go on tomorrow. They were cast out. They begged to go into the swine and they went into the swine and the swine ran into the waters and were drowned and that was the end of that. I just wanted to show you that part of it, though. And I'm going to have to bring this to a close now and listen. If you want to really understand your Bible. If you're willing to set yourself to devote a half hour or more every day to Bible study, you may enroll now for the "Ambassador College Bible Correspondence Course." There is no tuition.